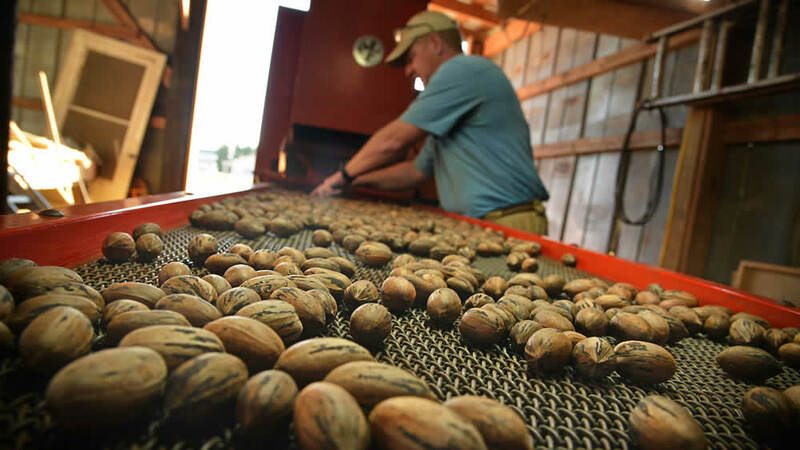 There are many business considerations when running a pecan orchard, which can be especially difficult when dealing with limiting land, floor management systems and herbicide options. Intercropping and livestock grazing are a couple standard pecan floor management strategies; the Horticulture Tree Fruit Program is in favor of the vegetation-free strip method for pecan orchard-floor management. The vegetation-free strip is frequently established and maintained with herbicides, with the grass sod minimizing soil erosion, soil aeration and permeability. Further minimizing tree damage or loss from voles during the dormant season. It is vital to always read manufacturer labels and properly calibrate sprayer equipment before herbicidal application.There are several registered pecan herbicides with pre-emergence and post-emergence as the most common. Pre-emergence control weed seeds prior to germination and post-emergence effecting existing weeds. Rotating herbicides often to prevent weed resistance. Orchards must be scouted monthly to determining present weed species and early detection of difficult-to-control weeds. • What Is Wrong With My Pecans? • We Produced Our First Black Périgord Truffles!